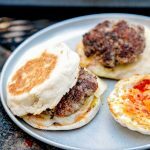 These sweet & spicy breakfast sandwiches are the perfect in-hand meal to get your morning started off right. Towards the end of the 2016 camping season, our paths crossed once again with our favorite brothers from Florida, Justin and Adam Fricke. The two were passing through New England as they wrapped up their 50 States in 1 Year project otherwise known as The Bro’d Trip. We pointed them in the direction of some free camping and drove out to spend a few nights camping with them. Now, when we’re cooking breakfast for ourselves we fall into all sort of bad/lazy habits. (Bread and a few spoonfuls of peanut butter does not a breakfast make.) But when we’re cooking for friends, we make sure to bring our A-game. After all, we run a camp cooking website and we’ve got a reputation to uphold. So we thought about what we could make that would both impress and scale well for a group? 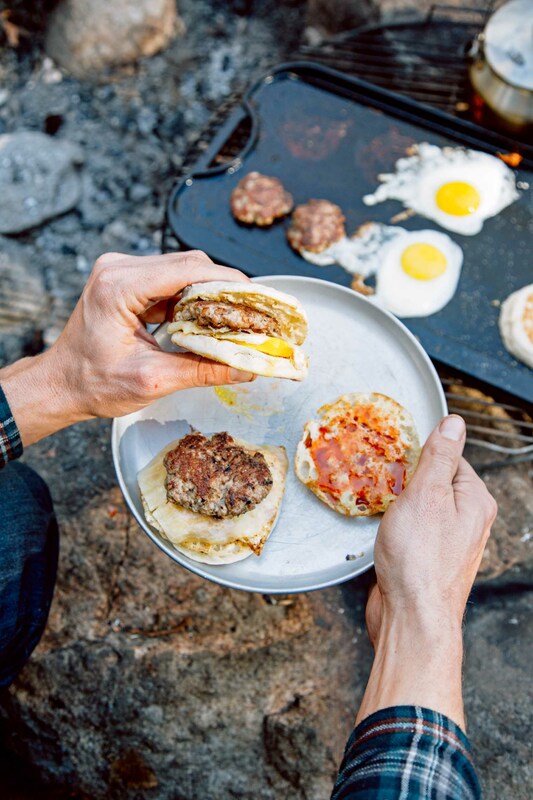 The answer: breakfast sandwiches. Essentially it’s just an egg, sausage, and English muffin diner plate served all together in sandwich form. Depending on when people wake up, you can make them all at once or just one at a time. If people have particular dietary restrictions, breakfast sandwiches can be individually modified. Plus, they’re served in-hand, so there are fewer dishes to clean up afterward. 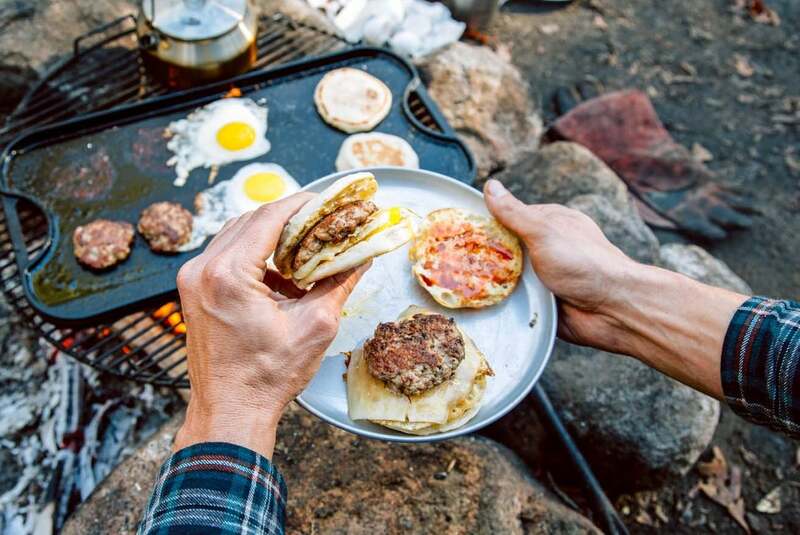 For this breakfast sandwich, stuck with the basics for the most part: handmade sausage patty, fried eggs, and English muffins. But we went a little wild with the sauce, blending two of our favorite camping condiments: honey and sriracha. The end result was a sweet, spicy, and thoroughly delicious. The Fricke brothers were fans and so were we. 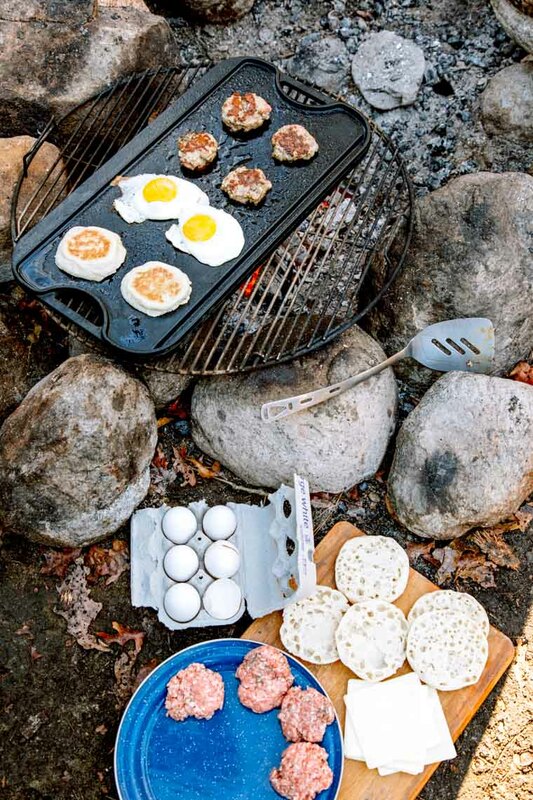 After a breakfast like this, we just might need to start camping with friends more often. ‣ The patties will shrink during the cooking process as fat is rendered out, so if you are making them by hand, make sure to oversize them. ‣ To avoid having a runny yolk in the middle of your fried egg (totally a preference thing), wait until the whites are nearly set and then lightly scramble the yolk with a fork. ‣ It is possible to make this meal using a single skillet, but it will take longer. Using two skillets at the same time is better. But if you really want to crank them out, there’s nothing better than a cast iron griddle. Place over a two-burner stove or directly over the fire and you’ve got a large cooking surface on which to work. PREP THE SAUSAGES: Mix the ground pork, herbs, and salt in a large bowl until thoroughly combined. Form into 6 equal sized patties, keeping in mind that they will shrink slightly while cooking. PREP THE SAUCE: Combine the honey and sriracha in a small bowl and stir together. Set aside. 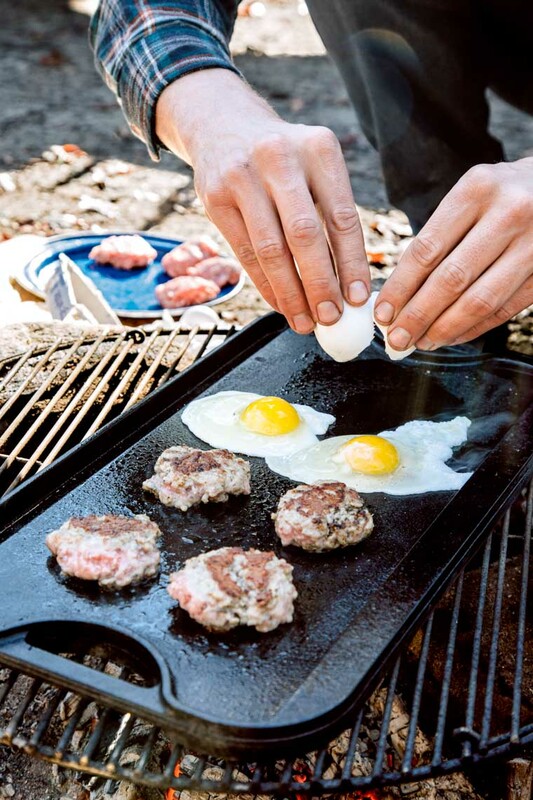 COOK: Heat a griddle or skillet over your campfire or stove top. Once hot, place the sausages on the surface and cook until browned, 2-3 minutes. Flip and cook the other side until browned, 2-3 minutes more. Meanwhile, cook the eggs as desired and toast the English muffins. 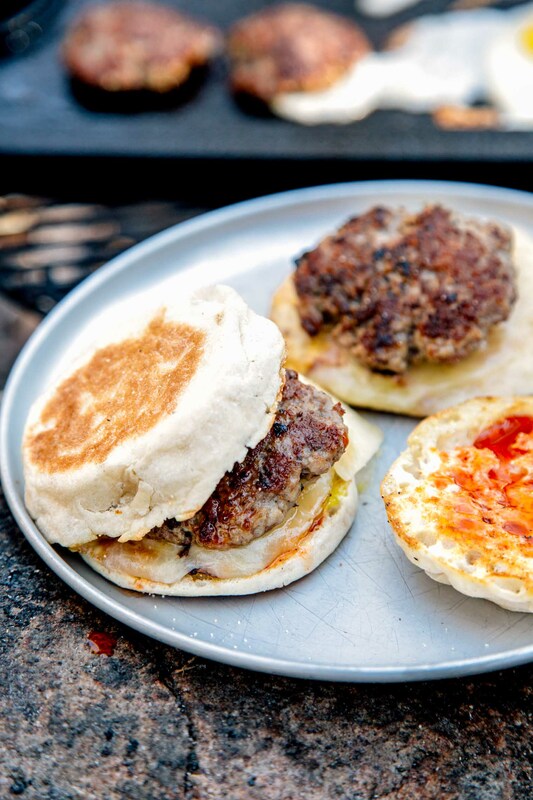 ASSEMBLE & SERVE: Spread the Sriracha honey sauce on the English muffins, then layer with a sausage patty, egg, and slice of cheese. Serve & enjoy! Make the sausage patties and place in an air-tight container in your cooler. The morning you prepare the meal, begin at step 2. I’ve made this more times than I care to admit. Honey + Sriracha is where it’s at! So good! It’s such an easy and delicious breakfast hack. Glad to hear you get to enjoy it on the regular! I cut a bell pepper into rings, throw on grill then crack egg in the ring. That way I’m not chasing the egg white all over the grill. And the pepper adds flavor. Excellent idea! I bet you could probably do that with a large Poblano or Anaheim pepper too if you wanted to add a little heat to your eggs. Thanks for sharing. We’ll have to try that out next time. Can’t wait to try. Curious about how you store/clean your cooking griddle and fire grate when you’re traveling/living in a small vehicle? Yeah, it’s super simple and combines two condiments we wouldn’t dream of going camping without!